Walter Iuzzolino is a fool in love. Walter Iuzzolino is the man behind Walter Presents, the digital, foreign language drama platform that has been a runaway success for Channel 4. The launch on Channel 4 was the product of three years of intense research by Iuzzolino and his business partners Jo McGrath and Jason Thorpe. They amassed thousands of hours of content and began pitching to broadcasters. “Jay [Hunt, Channel 4’s Chief Creative Officer] leapt on it from the start. She said it "makes sense. It’s clear. I want to do it.’ It was practically bought in the room” Iuzzolino recalls. Every show on the platform must meet at least two of Iuzzolino's three criteria: it must have enjoyed mainstream success in its country of origin; it must have outstanding writing, acting and directing; and it must have received critical acclaim. He later returns to this theme, in a moment or rare seriousness. “We live and die by like-minded souls that like and understand what we are doing” he says, explaining the platform’s success. Iuzzolino’s distinctive video introductions were another Channel 4 addition, and one that has paid dividends. He reports that over 90% of people who watch one of the introductions then go on to watch at least the first episode of the series. I suspect that putting Iuzzolino in front of a camera has been a Channel 4 aim for a long time. The man vibrates with a passionate energy. I can easily understand how he has managed to pull so many people along in the wake of his enthusiasm. Being the face of the platform has had unforeseen consequences for the Italian producer and commissioner. He recalls a recent Twitter encounter with two fans who refused to believe he was a real person. “I have been called many things in my life, but never a social voice. I am a person” he protests indignantly. “I went into my kitchen and wrote ‘I am real’ [on a piece of paper] and posted it online.” He laughs. The exchange plainly still tickles him. Building that community of viewers has been important element of the Walter Presents brand. “The deli is run by an individual that literally sources the olives, and when he tells you ‘eat these olives’, his reputation is at stake. That makes it more human and more meaningful in many ways” he explains. Fans contact him directly to recommend shows, which, he reports, he occasionally buys for the platform. The Walter Presents slate for 2017 is packed with Scandinavian dramas, including some shows from Norway, which until recently did not have the same creative output as more established Scandinavian territories. 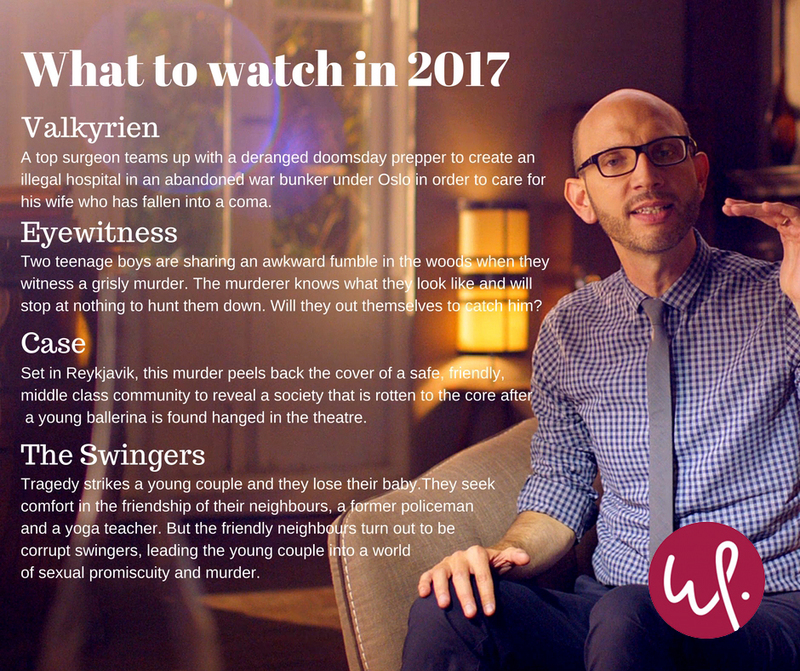 Iceland too is having something of a renaissance, with upcoming Walter Presents crime drama Case (to air in 2017) being named in the New York Times as one of the must-see international dramas of 2017. As he reports these successes, carefully attributing each one to the relevant production team, Iuzzolino grins, proud as a dad on sport’s day. The first episode launched on Channel 4 in a 10pm slot, by the time he arrived in the office the following morning, Iuzzolino reports that 11,000 people had already burned through the entire 16 episodes of the series. “It’s all quite exciting” he adds, as he sits quivering in his chair, beaming from ear to ear.